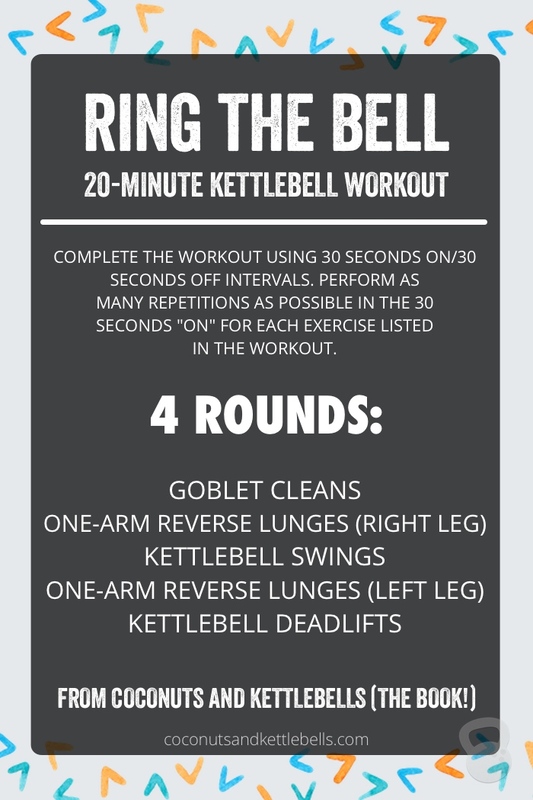 Ring the (kettle)bell just might be the perfect kettlebell workout. It has all the elements people are looking for with kettlebell training. It’s simple, easy to do from home, only requires one tool, and includes a combination of power and strength movements that work the entire body. The cherry on top? The workout only takes 20 minutes. It allows you to push yourself and knock out some stress, but doesn’t leave you dragging and exhausted. This kettlebell workout is a one of the workout from my new book, Coconuts and Kettlebells (page 319). In the book, there is an entire chapter on fitness and how to create a workout plan that is specific to you and your needs. The book also has three 4-week fitness plans tailored to beginner, intermediate, and advanced experience levels, and a variety of workouts that can be done anywhere and take no more than 30 minutes to complete. If you’re new to kettlebells, the book also gives detailed information about how to complete kettlebell movements, what weight to purchase, and how often to workout vs rest. Coconuts and Kettlebells also has an entire section on nutrition and how to tailor your macronutrient intake to fit your needs. There are meal plans, 75 simple and easy real food recipes, and material about mindset and how to make pursuing health sustainable long-term. 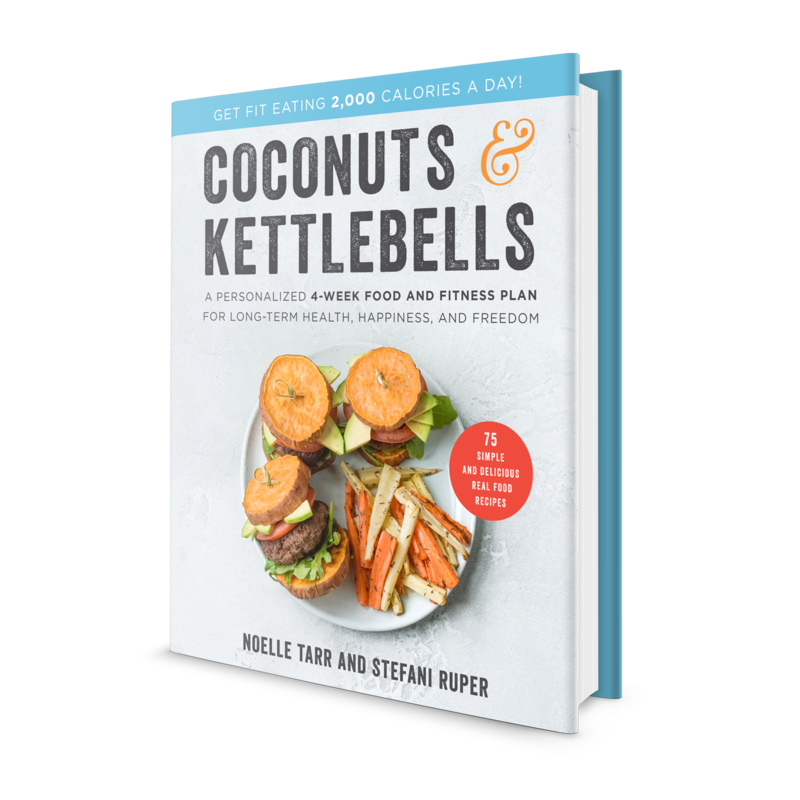 If you’re looking for guidance on how to create a personalize food and fitness plan that is specific to your needs, Coconuts and Kettlebells is the perfect fit. To complete this workout, select a kettlebell that is a moderate weight for you. In other words, the weight should be something you can move quickly, but still feels challenging and allows you to push yourself in the workout. Remember—there are four rounds to complete. The first round may seem a little easy, but the weight becomes much more challenging as you continue on in the workout. Your goal is to use the same weight throughout the entire workout, and you should be able to complete close to the same repetitions in each 30 second “on” period for each round. Directions: Complete the workout using 30 seconds on/30 seconds off intervals. Perform as many repetitions as possible in 30 seconds for each exercise listed in the workout. Rest for 30 seconds before moving on to the next exercise. Love workouts like this one? 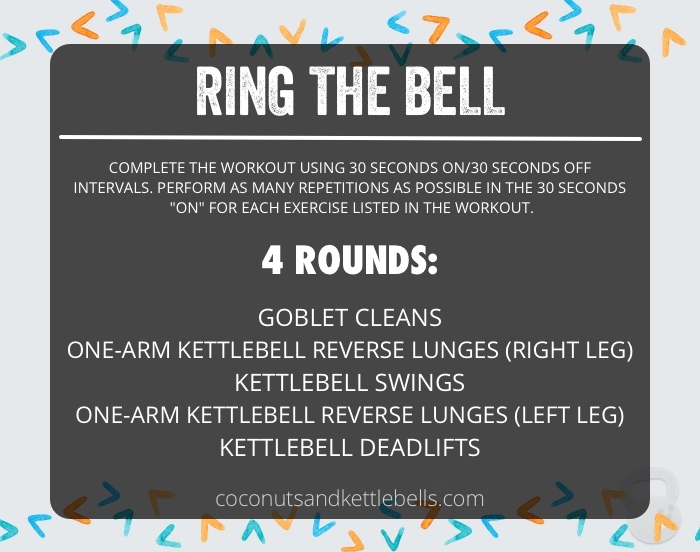 Check out my brand new book, Coconuts and Kettlebells, which has an entire chapter on how to create a personalized workout routine, and many more workouts just like this one! Do you have a description on how to perform each move or exercise? Hi Heidi! I do, but it’s actually in my book. Exercise demos and descriptions are rather involved, so getting the book is definitely worth it!